Blog - Winter is Here! The recent cold snap got us thinking about keeping a loft conversion warm in the winter. Not a problem for those with modern conversions that are well insulated and have a radiator plumbed into the central heating system. But what about those with older conversions that might not be insulated to such a high standard and no central heating? We decided to have a look at Amazon.co.uk to see what electric heaters are currently available. These are great if you need something quick and cheap. We would suggest that you avoid the really cheap fan heaters, we have found that the fans tend to be made with cheap bearings that soon become noisy. Something mid-range like the De'Longhi 3kW Fan Heater has an output of 3kW, two heat settings and has overheat protection for safety. Made by the reputable company De'Longhi this heater is currently available for £19.99 from Amazon, we think this represents good value for money. If you want something that looks a bit nicer, doesn't make any noise and can put in place permanently without losing any floor space then panel heaters are the way to go. 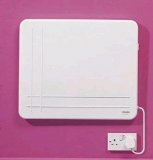 For £44.18 you can get a 400W Dimplex Panel Heater. These are great because they are slimline, look good and offer a more permanent solution. These heaters seem to have become popular in recent years. We think these work well for keeping you warm while you are in a room, but we wouldn't recommend that these are left on unattended. Ideal, for example if you use your loft conversion as an office but only spend a few hours there at a time, rather than heating the whole room you could use a halogen heater to just keep the heat where you need it. Halogen heaters can be bought very cheaply, mainly due to their simple design, for example the Prem-I-Air 800W Halogen 2 heat Fold-Up Heater is available for only £8.99 from Amazon. So there we have a few ideas to help you warm this winter. All prices listed above were correct as of 20/12/2009. See below for some more deals we spotted while browsing Amazon.